Spectacular snow-capped peaks, a world-class train system and a reassuring sense of safety make Switzerland an enviably perfect family travel destination. But with so much beautiful scenery and so many picturesque towns and villages, where exactly should you go? We’ve taken the guesswork out of the equation with a weeklong itinerary that will give you a true taste of all (the chocolate!) that Switzerland has to offer. We suggest pairing a few days in your “fly-in” city with four days in a mountain destination — of which there are plenty. Switzerland wins the Alpine prize, with 48 peaks spread over 4,000 meters. This approach will allow you to tick the boxes on iconic sights while leaving ample time to appreciate the stunning vistas with a minimum of fuss. Most visitors will fly into Zurich, and it makes an ideal home base for the beginning of your trip. Two days in Zurich will give you a great sense of the city. Start on Bahnhofstrasse, brimming with luxury boutiques and watch shops and known as one of the most expensive shopping streets in the world. Then amble around the medieval Altstadt (Old Town). Kids will enjoy the Muhlestag footbridge, famous for its love locks, and hunting for potable water at more than 1,000 fountains. Hint: look in the pretty squares, and make sure to carry an empty water bottle! Art lovers will want to stop into Fraumünster (Church of Our Lady) to see the Chagall windows. Visit in the morning for the best light and bring paper to let your kids imitate his swirling romantic style. Nearby, the twin towers of the Grossmünster cathedral, one of Zurich’s landmarks, offer great city views from the top. Stop in for lunch at Sternen Grill, famous for its sausages and boasting the crowds to prove it. For an authentic Swiss chocolate experience, Lindt offers occasional classes at the Lindt Chocolate Workshop in Zurich, but you must book in advance as they often sell out. In the afternoon, take a boat cruise on the Limmat River. Or better yet, visit Schwimmbad Oberer Letten, a traditional swimming area along the Limmat. Insider tip: Act like a local and pack a picnic to enjoy along the banks. For your second day, slightly outside the Altstadt are several interesting areas that offer a distinctly different flavor than the cobblestoned center of Zurich. Teens will particularly enjoy wandering around the edgier, design-driven shops built under the railroad tracks at Im Viadukt; its food hall offers a bounty of local specialties. Adjacent Frau Gerolds Garden is a kitschy hangout constructed from large shipping containers. On a pretty day, sit outside and enjoy the garden and vibe. Take a 5-minute cable car ride to Felsenegg for unbeatable views of Europe. Go just for the views or stay for lunch at the restaurant. If the weather doesn’t cooperate, instead check out Alpamare, the biggest indoor water park in Europe. It offers something for everyone, from zero-depth entry pools to a vast array of slides and water features. At dinnertime, venture to Jura Blick for fondue, an authentic Swiss dining experience in the forest. Take the S10 train to the top of Uetliberg and then walk down the mountain about 20 minutes. Don’t forget to make a reservation. On day three, we suggest an easy day trip to Lucerne or the Swiss capital of Bern (each is under an hour train ride). In Lucerne, don’t miss the picturesque Kappelbrücke bridge spanning the Reuss River, the charming Lion of Lucerne carving, or simply a stroll along the shores of the lake. You might even consider a trip up Mount Pilatus to enjoy the views. In Bern, soak up the atmosphere of its UNESCO-listed medieval center, filled with shops, cafes and fountains. TIP: We also love the French part of Switzerland, and if you fly into Geneva, you can easily make this the home base for the first part of your stay. If you go this route, explore Geneva itself as you get acclimated and then branch out to Lake Léman (Western Europe’s largest lake), the UNESCO-protected Lavaux wine region, Creux-du-Van (the Swiss version of the Grand Canyon) and perhaps even a jaunt to Gruyeres for their famed fondue. To explore the Jungfrau Region, home to Switzerland’s highest and most breathtaking mountains, make Interlaken your base; it’s centrally located and has the easiest transport connections. The Jungfrau area is part of the eastern Bernese Alps and is anchored by the 13,000-foot Jungfrau (Maiden) peak, as well as Monch (Monk) and Eiger (Ogre), with deep glacial valleys in between. In the immediate vicinity, there are several quintessential mountain villages to explore. Activities are varied and plentiful but shift noticeably based on time of year. Upon arrival, stroll down Höheweg, the main promenade connecting Interlaken West and Interlaken Ost. Stretch your legs in the flower gardens and parks as you look toward the Alps, then check out the shops and cafes that line the other side of the street. Kids flock to Funky Chocolate Club, where they can taste, create and decorate their own Swiss chocolates. Then, depending on the season, try your hand at kayaking or stand-up paddleboarding in crystal-blue Lake Thun or Brienz, or spend the afternoon at the extensive Ice Magic rinks on Höheweg. Devote one day to taking the Jungfrau Railway up to the Jungfraujoch, the highest train station in Europe at 11,000 feet. A highlight here is the view of the Aletsch glacier, the longest in the Alps. It almost goes without saying that the views here are hard to beat; just remember to dress accordingly, as the Jungfraujoch is encased in ice and snow year-round. Grindelwald is a mountain resort town famed for its extensive skiing in the winter and hiking in the summer. If heights don’t test your nerves, amaze friends with pics taken at First Cliff Walk, a crazy-high pedestrian suspension bridge and viewing platform. Sunny Wengen, accessible only by train, is a storybook Alpine village surrounded by more than 60 miles of skiable terrain. Enjoy the atmosphere and lunch at the crowd-pleasing Da Sina. Car-free Murren is another fabled destination, with expansive views of the region’s peaks and valleys. Take a 20-minute cable car to the top of the Schilthorn for breakfast in the revolving restaurant (featured in the James Bond film On Her Majesty’s Secret Service). Then ski or toboggan down from the top in winter or hike down in summer. Families will particularly enjoy the welcoming Allmendhubel Flower Trail and flower-themed playground, as well as the panoramic restaurant. Nearby Gimmelwald is another Alpine dot on the map known for its skiing and hiking. Note that this village is only accessible by cable car or on foot. Trummelbach Falls (accessible in summer only) are a fun stop with school-age kids and up. You’ll be overcome by the sheer force of the 20,000 liters of water that drain each second from the Eiger, Monch and Jungfrau peaks from within the mountain. There are serious stairs to contend with, and we do not suggest taking little ones, as it can be dark and slippery. Bring cash, as no credit cards are accepted for entry. 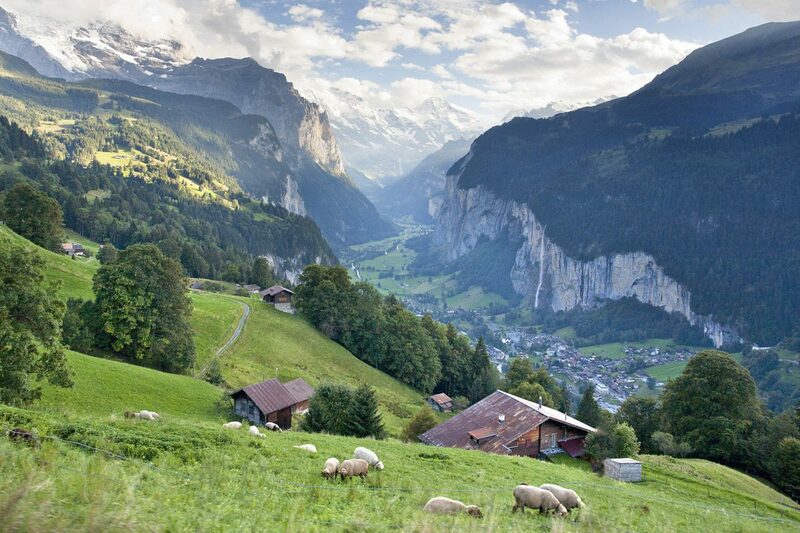 Home to only a few thousand people, quaint Lauterbrunnen lies in the valley amid the region’s highest peaks. The valley contains more than 70 waterfalls, the highest being Staubbach Falls. Head toward Murren and stop in at the scenic Winteregg Mountain Restaurant for a lunch of Swiss favorites. The views are terrific, and if the weather is conducive, you can sit outside and the kids can play games or jump on the trampoline. The Swiss Open-Air Museum at Ballenberg celebrates Swiss heritage. Take a step back in time amid this pastoral setting and see what a traditional village would have looked and sounded like. Kids will enjoy the petting zoo and a glimpse of people in traditional dress at work in different capacities around the property. Chateau d’Oberhofen, located on the banks of the Thunersee near the town of Thun, is a classic example of a Swiss castle and dates back to 1200 A.D. Take a guided tour and enjoy some of the most beautiful gardens in the region. Seilpark Interlaken is a vast ropes park that offers nine courses with over 120 challenges for those who enjoy vertical thrills. An engaging option for teens, Seilpark also organizes rafting, paragliding, sky diving, canyoning and scenic flights. Check the website before you go, as they are in the midst of rebuilding after storm damage. TIP: For families who truly want to settle into an Alpine escape, we also love Zermatt as an alternative to the Jungfrau Region. Home to the Matterhorn, Zermatt is a year-round paradise, enticing families with its car-free atmosphere, extensive ski program for all ages and fully operational gondola system. It is a bit more isolated than the Jungfrau Region, but offers a decidedly different perspective on Switzerland’s natural beauty — there is a reason that it’s world-famous. I’d love to visit Interlaken as per your input above but I don’t see a hotel recommendation from you for somewhere to stay there. Do you have any recommendations? Hi Stacey – We maintain a list of vetted hotels that are ideal for families…one of our Family Travel Advisors can help and will reach out in email to follow up. Happy travels!